Who is that gorgeous new face on RoyalVintageShoes.com, our Facebook, and Instagram? Meet Tina Vines, vintage fashion enthusiast and entrepreneur. 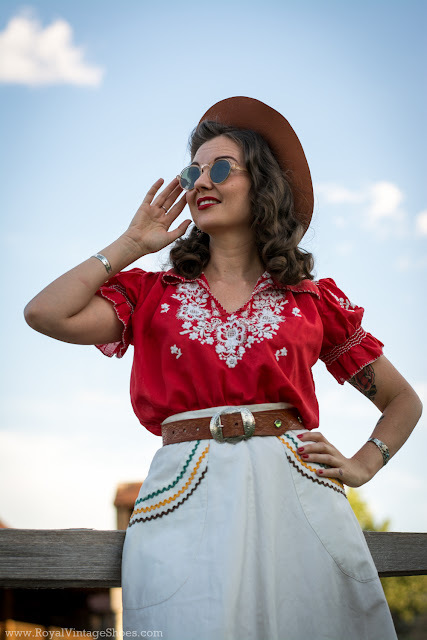 Tina modeled a beautiful original vintage western outfit for our mid-Summer photo shoot recently. 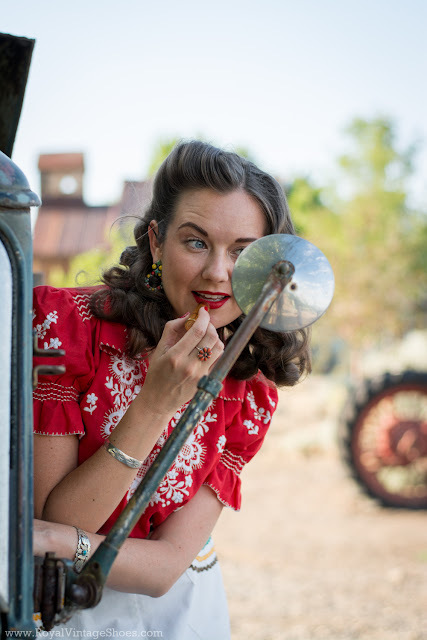 With her unique aesthetic and up-for-anything personality, we knew she was the perfect '40s gal for this imagery. 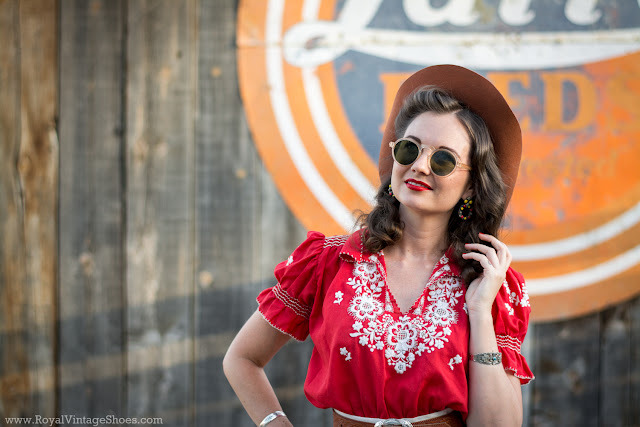 RVS: How long have you been into vintage fashion? TV: I've loved "old things" since I was a kid, which I'm sure began when my grandma would take me antiquing and to yard sales in the south. I was very experimental with my clothing as a teenager and liked to make and alter my wardrobe in any way possible, although "vintage" wasn't really on my radar. However, once in college, I began majoring in Apparel Design and delved into fashion history and clothing design. I developed a great love for vintage fashion, but didn't start dressing in a vintage style until I was about 25. Tina modeled the "Dolores" 1940s Slingbacks in green. Click through to shop these shoes. RVS: What is your favorite decade? TV: I've always loved the hairstyles and clothing of the 1940s over any other decade. The styles are so feminine and glamorous yet practical/wearable. I love the figure-flattering narrow waist and broad shoulder silhouette as well as the knee or calf length skirt. There is also a playfulness to 1940s fashion that appeals to me: novelty prints, platform shoes, playsuits, fun separates, vibrant colors, etc. RVS: What is your favorite style or genre within your vintage focus? TV: I really love vintage western wear! I've grown more obsessed with it in the last few years and have really embraced the style. There were great western films being made in the 1940s and 1950s, my favorites feature Roy Rogers and Dale Evans. Western wear grew in popularity at this time and there were such beautiful garments being made. I love the heavily embroidered western shirts worn in the movies, rhinestoned and fringed suits worn by western singers as well as the more wearable styles that were seen on ranches and/or worn by real cowboys & cowgirls. There is also a related style/genre that I love which is southwestern inspired fashion. 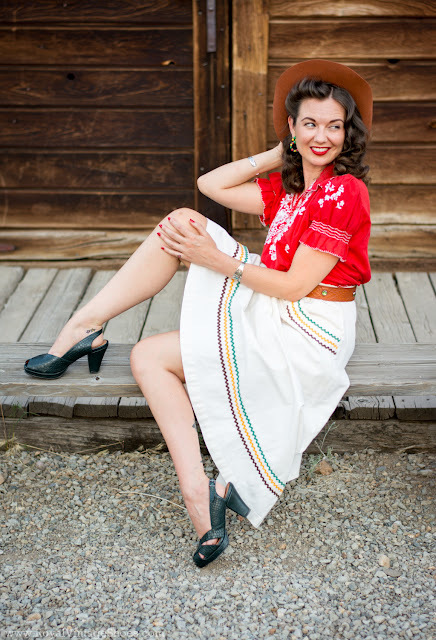 I collect vintage southwestern jewelry and Mexican embroidered blouses, which I love to mix with my western wear. 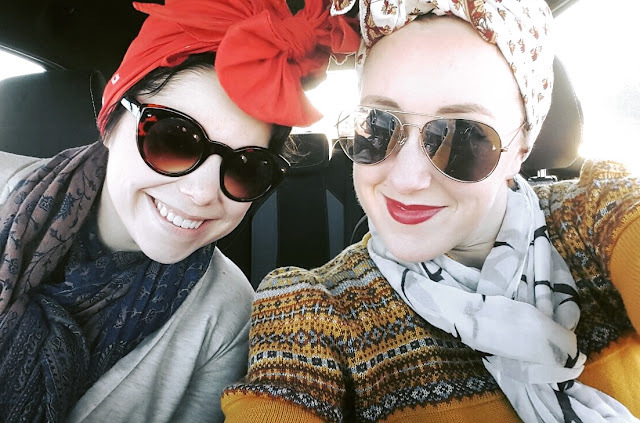 RVS: What are your styling tips to newbies getting into your favorite vintage fashion focus? TV: Hmm..I guess I'd say that it is easy to look too costume-y when wearing western wear. I would suggest looking for inspiration in gals like Dale Evans who wore the western clothing in a classic way. RVS: Where are you favorite places to shop? TV: I love to scour antique malls and vintage stores for treasures but also buy on Etsy or Ebay. I'm quite a bargain hunter, so I tend to wait until I find a good deal. However, I will splurge every now & then when I find the PERFECT item at a Vintage Expo or shop. RVS: Do you have any beauty/styling tips for hair/makeup for our readers? TV: My simple beauty tips are - set your hair with foam rollers and setting lotion (Lottabody) for that classic 40's wave, do a strong yet natural brow, use neutral eye shadow shades ( I like colors in the tan/brown/copper family), apply a nice mascara and of course a bold, matte red lip! My favorite lipsticks are Sephora cream stain (color 01), Besame Red Velvet and Mac Russian Red. For mascaras, I like Besame cake mascara and Benefit Roller Lash. 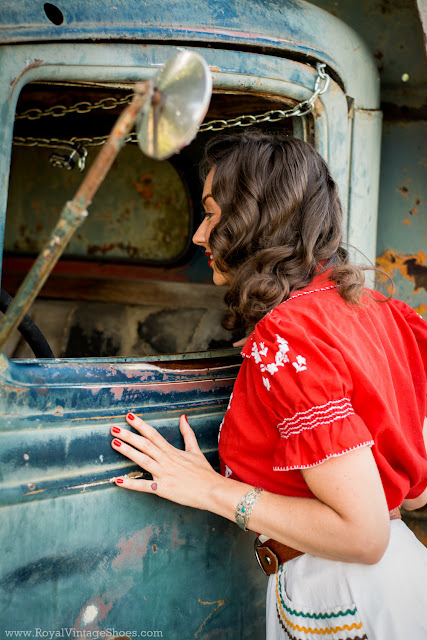 RVS: Do you work in the vintage fashion world? What do you do? TV: I do custom chainstitch embroidery using an industrial embroidery machine that is just over 100 years old. This kind of embroidery is commonly seen on vintage western wear, bowling shirts and letterman jackets. I do a wide array of custom work but especially love doing vintage lettering, floral designs and western motifs. I also make felt purses and patches which I sell in my Etsy shop, Vines of the West. RVS: How can we find out more about your business/products? TV: I have a website for my embroidery business, Vines of the West, as well as an instagram page & an etsy store! Wow! Great pictures :) Loved your smile! We have got some relevant piece of information on Sewing Machine & their usage! Take a look!